What is it? Hydronic snowmelting is a system where PEXa pipes are buried in concrete, asphalt or under pavers, circulating a warm water/glycol mix through it, warming the surface thus melting the snow/ice on the surface. 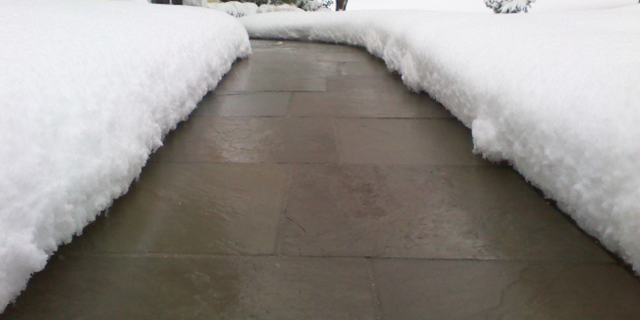 There are many reasons for wanting or needing to install a snowmelt system. In most cases there are several features or benefits taken into consideration when making that decision. Using the knowledge, products, and experience, we eliminate any concern you may have by guiding the contractor in the design and installation process for an optimized final result. Have you ever been to a hospital when it has been snowing and noticed that there typically isn’t any snow or ice in front of the doors? Most hospitals have snowmelt in the entrances to reduce the chance of patients and visitors slipping and/or falling. Creating a safe no-slip surface for elderly or handicapped people, easier access, reducing liability of someone getting hurt from falling and injuring themselves. Creating an aesthetically pleasing area free from sand and chemicals or damage from mechanical snow removal. The MrPEX® Barrier PEX-a tubing has proven durability at the highest level and comes with a 30 year warranty. In addition, by using snowmelt in areas with pavers or decorative concrete, wear and tear is reduced significantly, increasing the life of the surface and structure. Taking advantage of waste heat from a heat plants or industrial processes nearby eliminating the need for paying for plowing. By melting snow and ice with a warm surface, we are simply creating water as runoff, no salt or chemicals, and will not impact nearby water sheds. The system can be designed utilizing an automatic control strategy that will sense snow fall and surface temperatures and automatically turn the system on and off as needed. This allows for a more managed control approach with big energy savings as compared to a manually run system.